Your Outlook items should now sync with iCloud, which also syncs with your iOS device. Thus i notice when i updated/edit the 2nd no in outlook contacts its not sync to my phone. Mitch. Great article. I used Outlook 2007 until not supported any longer and syncing to iphone contacts through iTunes worked great. I upgraded to Outlook 2016 and now I can’t get iTunes to sync. Outlook 2016 creates a default name.ost file when email account is IMAP. I created a smtp file where Outlook 2016 creates a name.pst file. Apple doesn’t read .ost files, but likes .pst files. I also deleted some contacts because Apple contacts only allows 2,500 contacts. I can’t get iTunes to find the outlook.pst file and sync. Outlook 2016 puts this file in MyDocuments\Outlook Files, but iTunes doesn’t find it there or a copy in C:\..app..\Microsoft\Outlook either. Can you think of how to make certain that iTunes is finding the right file? Apple is stumped. Thank you. Thank you Mitch for writing the article to help! 2. Sync-ing Calendar has no problem whatsoever. 3. 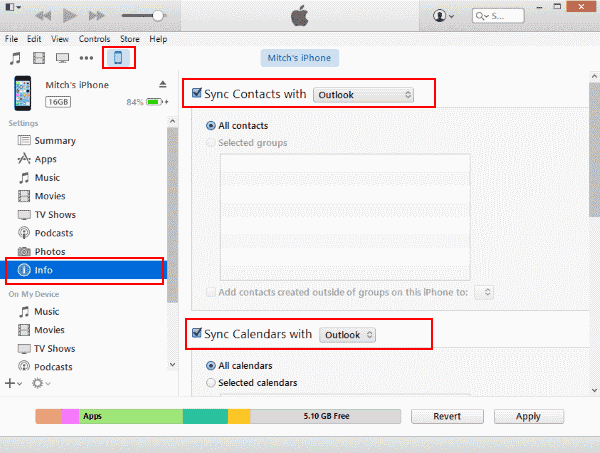 For Contacts, I know new entries in Outlook can sync to iPhone without any problem. But not the other way round. But, modification done to a record in iPhone can sync back to my Outlook without problem. To work around the problem, I had entered some dummy records with names simply like A1, A2, …A20 (so, 20 records) in Outlook Contacts. These records appear in my iPhone as soon as I sync’ed them. When I met new customers on the street, I would modify the A-records and put real names and other info in the iPhone. When I got home or office, these ‘modified” records would appear in my Outlook as soon as I sync’ed them. I wished I don’t have to do that one day. For now, it works for me without fiddling around with iCloud. And the saga continues. Once you’ve connected to iCloud Contacts, your Outlook 2016 Contacts collection ca no longer be displayed in Outlook 2016. App to app field mapping is minimal. The cleanest mapping is to use a lastname,firstname format in all naming fields. Finally figured it out by picking Harvey’s comments apart and using Option 1. Uninstall all Apple applications before attempting to install iCloud for Windows on your PC, including iTunes. If you’ve installed Outlook for iOS on your iPhone, remove it. Once iCloud for Windows is installed, open it, log into your iCloud account and work through the synching and sharing options (photos, mail, calendar, contacts, reminders, etc.). iCloud drive was not selected due to possible subscription fees.. Due to space limitations because of a previous iPhone backup, I selected contacts only. My laptop’s Outlook 2016 Contacts folder were then uploaded to my remaining allocated space in the iCloud. On your iPhone, go to Settings, Your Name (top of list), iCloud, and turn Contacts on. Other than Backup, I deselected all the other options to match my sharing and synching options in iCloud for Window. Then in Settings, Contacts, Default Account, select iCloud as default source for contacts. Close out of Settings, and open iOS Contacts app. Your PC based Outlook 2016 contacts should all be available. I hope that I have not overlooked something in this article but it doesn´t seem to help me solve my problem. Here goes… I need to sync new contacts from the Contact-app on the iPhone to my Outlook Exchange account. It is working fine from Exchange to iPhone but not the other way around. I have tried disabling the “Sync contacts to iCloud” optin on my iPhone, connect to iTunes and select “Outlook” as contact “buddy”. Nothing happens when i complete the synchronization. None of my contacts from the Contact-app are synchronized to Exchange. I have spent weeks trying to migrate my Outlook 2016 contacts folder (now Peoples app) collection on a Window 10 laptop to an iPhone 6 (iOS 11) and it has been a nightmare. I feel that I am standing in the middle of a battlefield where Microsoft and Apple are exchanging live fire. This is a turf battle over web-based storage. iCloud drive versus OneDrive (and Amazon’s web drive lingering in the wings) where consumers are repeatedly faced with the decision to select one, and only one. All parties are blame. I was with Apple support level 1. Apple support level 2. They contacted Apple Support engineers, and their answer was – iTunes with a cable between computer and iDevices shouldn’t be used for what I’m doing, and that it will never work again after iCloud has been installed. PS – I think that is a copout answer. I tried the iCloud way, and do not like it. iCloud cannot handle rich text calendar entries. if you touch one character, all characters go to plain text (and lumped together in one paragraph). but I found a solution. I have another windows 10 computer, that has iTunes installed the old way, not an App way through Microsoft App Store (Apple doesn’t allow you to install iTunes the old way anymore by downloading an .exe file, it now points to Microsoft App Store). My iTunes on that windows 10, outlook 2016 computer will sync to iDevices with a cable. And I use CodeTwo OutlookSync to get my outlook calendar and contacts to another computer. I called Microsoft Support. They said, “To Sync calendar and contacts on your outlook 365 on windows PC you will have to install icloud. Once you install icloud, you can select inbox, calendar and contacts that will sync with outlook. 1 – Microsoft Office 365 from the Microsoft Store is not the Desktop version. You need the Desktop version for the sync from iPhone to iCloud to Outlook 365 to work. So we uninstalled my previous install of Microsoft Office 365 which I installed from the Microsoft Store. 2 – If you try to install iCloud for Windows but have the Microsoft Store version of Office 365 installed, you will get “Problem with this Windows Installer Package” when you try to install iCloud for Windows. 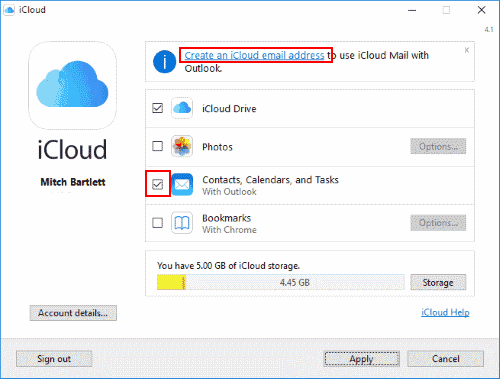 3 – You need to uninstall all portions of iCloud for Windows including Apple Software Update, Apple 32 Bit, Apple 64 Bit, and Bonjour before trying to install it again with the Desktop version of Outlook. This also means that you need to uninstall iTunes then reinstall it later. I can now sync my Contacts and Calendars from my iPhone to iCloud to Outlook 365 and also from my Outlook 365 to iCloud to my iPhone. Mike van de Water – you say to make sure Outlook is the default file. what does that mean? Mitch, you say iCloud must be turned off for Option 2. I never had to before, but for my new Outlook 2016 I’ve tried doing it as per your suggestion. But iTunes Syncs for a bit, same length of time as ever, but nothing changes on my iDevices. Anything else need to be turned off, of on? How did you learn to turn iCloud off, for 2016 to work? thanks anyone for help please. I need my mobile devices to have an accurate calendar, and accurate contacts. they are getting email directly from my ISP server. Revision to Option 2: I got USB sync to Outlook 2016 to work eventually. I _think_ the trick was to change the default Outlook PST data file. 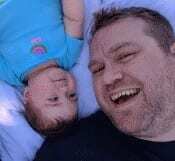 File – Account Settings – Account Settings [again] – Data Files. Make sure “Outlook” is the default file. I also turned off the iCloud settings on my phone (i.e. reversed the Option 1 steps above) and on the iCloud software I’d downloaded to my Windows PC.. Thanks for the article. It did not help me solve my problem, though. I just moved from an old laptop running Windows XP to a new laptop running Windows 10. The contacts and calendar on my iPhone 6s Plus are up-to-date and important to me. I want to copy the contacts and the calendar of this iPhone to MS Outlook 2016 on my new laptop. How do I do that using iTunes? When I choose which information I want to sync in the Info panel for my iPhone in iTunes (viz. “Sync Contacts with Outlook” and “Sync Calendar with Outlook”), I keep getting this popup: “The information on the iPhone “so_and_so” is synced with another user account. Do you want want to sync this iPhone with the information from this user account instead?” And then it gives me two options: “Merge Info” and “Replace Info”. What does that mean? I simply want to replace the (empty) contacts and the (empty) calendar of MS Outlook 2016 on my new laptop with the (up-to-date) contacts and (up-to-date) calendar of my iPhone 6s Plus! I don´t want to lose any information on my iPhone 6s Plus! 1. I have never successfully been able to install icloud on any Windows Computer running win7. 2. If I try to sign out of icloud on my ipad, it tells me it will delete the account! I really don’t think I have an icloud account, but maybe I did once. Excellent, comprehensive, and clear. Thanks for writing this article. Is there a way to sync the contacts for android? So I recently upgraded to Windows 10 on work exchange server. I have always been able to use option 2 and sync my calendar and contacts. Since my upgrade to Windows 10, my calendars are not visible. Is there a fix for this? Thanks in advance! I am trying to find a way to keep email, calendar and contacts in synch across an iPhone6S and a Win10 Laptop. I have Office 365 (Outlook 2016). My email address is on a domain I bought myself from Fasthosts. Fasthosts are saying I need to buy an Exchange mailbox for this which costs £60/year for each user (4 in my family). Do you know of a better/cheaper way? The instruction says “From the Home screen, select “Settings“. Sure. You can use one of the other options noted on this page. Thanks for the article. I am running MS Office 2016 PP in Windows 10. When I download iCloud it is version 6.2 where it says I can sync contacts and calendar via iCloud.com. I do not want to do that but integrate iCloud into Outlook 2016. is that posssible please? If so how?